As early as the 1700’s Dragør was an active seafaring town connecting to faraway horizons. Most of the young men in Dragør went to sea at age 14. They were either hired on one of the city’s many sailing ships, or they served in the Danish Navy. Boys were registered at birth in the ‘Navy Muster Rolls’. The women worked at home doing household chores – they also wove linen. The enlisted sailor’s wives had special permission to sell linen in the Copenhagen markets. The money earned by weaving was of great financial help to the families whenever the men were on duty in the Royal Navy – or in less prosperous times. In 1801 – while times were still good – 68% of the Dragør male population over 15 was still employed in shipping. However, at the beginning of the 1800s hard times came to Dragør – partly due to the Gunboat War with England (1807–14) and partly because of the State Bankruptcy in 1813. Furthermore, Dragør had been mainly investing in sailing ships e.g. small coasters, while many harbour cities in the rest of Denmark had been purchasing the more competitive steamers. For those who were poor or without a job in Dragør in the 1800s there was very little help to be had – even after two ‘poor houses’ were established. One was established in Store Magleby in 1830 and another in Dragør in 1832. Due to the economic crises in the 1800s, many emigrated from Denmark to overseas destinations. In Dragør several ship owners, as well as skippers, were forced to sell or even break up part of their fleets. However, unemployed Dragør seamen, especially ‘Able Seamen’, were finding work in other harbours, for instance, Copenhagen. Therefore, only about 1–2 % of the sailors in Denmark – including Dragør – left the country for good. In 1835 Dragør had 1602 inhabitants, and in 1922 the number had risen to 2048. During this period only 136 persons (of whom 103 were male) were registered as ‘emigrated’. It was mostly younger, unmarried men, who left Dragør, and almost half of these were registered as ‘youngest son’. 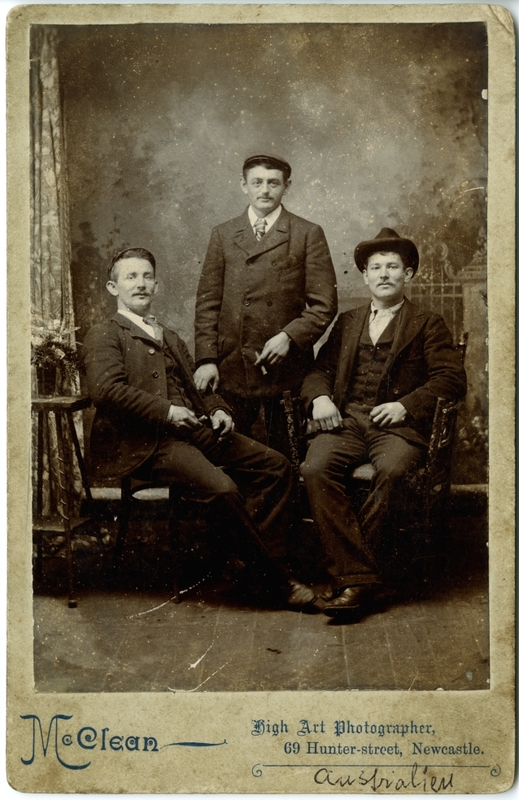 Probably these young men had difficulties finding a job in their family circle, as well as in the local community. Reports made in the1850s by returning seamen about the big Gold Rushes in California, Klondike, as well as Australia, probably inspired many of the ‘youngest sons’ to leave. The young Svend Kjempe was one such young person. In the late 1850s, he returned home from the USA and Australia as a man of fortune. Also, Hans Dirchsen Præst made his luck overseas – in Australia – where he had made good money as a contractor for the gold diggers. However, only 15 persons actually made it as far as Australia between 1835 and 1922 – and only a few stayed on. Tønnes Clausen Finne (Thomas Clausen), Niels Hansen Krøjer, Wilhelm Martin Schubert and finally, Harry Skaarup and family. In the summer of 2011, Dragør Local Archives was contacted by June Blackburn from Australia. She was searching for information about her great-great-grandfather, Thomas Clausen, who had told his Australian relatives that he was born in Dragør, Denmark. Unfortunately, Thomas Clausen’s name was nowhere to be found in our data base. However, by using his date of birth, we soon realized that the person in question had to be ‘Tønnes Clausen Finne’. ‘Tønnes Clausen Finne’ apparently had changed his Danish name to the more English-friendly name ‘Thomas Clausen’! Tønnes Clausen Finne was born in Dragør in 1838 on July 12. His father, Able Seaman Claus Nielsen Finne, died in 1854, when Tønnes was 16. His mother, weaver, Gerte Tønnes Jansen Theis, died in 1869. Tønnes had four siblings: Niels – Ane – Benthe – Peter, none of whom have direct descendants. Niels, a sailor, drowned on an expedition to Constantinople in 1853. Ane, a weaver like her mother, died in 1875. Ane had three children: twins, who died shortly after birth, and one daughter, who died childless. Benthe died aged 8, and Peter, also a sailor, died in 1864 aged 24. The tragic circumstances of his family probably contributed to Tønnes Clausen Finne’s decision to leave Dragør to seek a better life far from Denmark. The last time Tønnes Clausen Finne was registered in Dragør – as a sailor – was in the Census of February 1860. In December 1860 he was – for the first time – registered as ‘Thomas Clausen’ when he arrived in Sydney from New York as a crew member on the American ship ‘Beaver’. (The Shipping Master’s Office/NSW; Passengers arriving 1855–1922). Furthermore, Thomas was noted as an A.B (Able Seaman) with a Merchant Mariner’s Document, which qualified him as a ‘lookout’ or ‘watchman’. He was also ‘responsible for performing security procedures on board’. What happened directly after his arrival is not documented. Thomas Clausen either gave his notice, was fired or ‘jumped ship’, which many sailors often did in those times. He left Sydney and found work as a miner in many different places: seven years in NSW, one year in Victoria, six years as far away as New Zealand and finally, arriving in Stanthorpe/Queensland. Here the 36-year-old Thomas met his young wife, Maria Virginia Burnett (19) born Woolshed Creek/VIC. They were married in St. Paul’s Church, July 24, 1875. The couple had 4 girls in Stanthorpe and then moved to Emmaville/NSW, where another 6 daughters and 2 sons were born. Thomas Clausen continued working as a miner and died aged 79 in 1919. He is buried in Emmaville Cemetery/NSW. Considering the sad destiny of Thomas Clausen’s Danish family in Dragør, his long life and the number of healthy children born in Australia (12) shows that the good life he had been longing for in Australia was not an unrealistic dream! Today Thomas Clausen has many descendants in Australia – as well as in New Zealand. Niels Hansen Krøjer (NK) was born December 6, 1888 and baptized in the Church of Dragør on January 13, 1889. NK: “I went to C.C. Petersen’s School in Dragør, where I took a lot of beating. In 1903 – after my confirmation at church – I was sent to sea, as were a lot of boys in those days, because I never got an education, and there was nothing else to do”. Further NK declares: “In 1904 – at 16 – I was hired on the ship ‘Albert’ in Malmø and loaded coal in Finland. ‘Albert’ sank 12 months later and lost all men aboard. Following I enlisted on ‘a Swede’ for 5 months, then on the steamer ‘Axel’, and finally on ‘Romer’. When my mother passed away on September 27, 1906, I was in Liverpool. “From 1907–1909 NK I sailed to Cardiff – Saint Croix – Hamburg – Rotterdam – Bilbao – Saint Thomas – Messina –Venice – the Black Sea – Philadelphia (where I jumped ship) – Newport (went to hospital there). After that I took hire on a four master in San Francisco and sailed up and down the American West Coast for 156 days and even worked on land for a while”. Niels Krøjer was then mustered on ‘an Englishman’ and sailed to the Pacific Islands, New Zealand, Melbourne and Sydney. Times were bad in Sydney, but he got work for 3 weeks with the railway in The Blue Mountains. On November 1, 1909 he returned to Sydney, but a general coal strike had just started in Newcastle/NSW, so there was no work to be had. NK therefore, became a fireman on a Norwegian vessel and celebrated his 21st birthday in Port Adelaide/ S.A. He was then jailed in Newcastle, losing his job as a fireman. Due to the strike in Newcastle, NK was hired on a four mast barquentine sailing to San Francisco – the trip took 93 days. He worked on a farm in Northern California for a while then sailed back to Adelaide. This time the trip took 95 days. On January 6, 1911, Niels Krøjer went ashore for good in Adelaide and settled there. In the beginning NK was staying with his uncle (his father’s half-brother), Peter Johansen, who had arrived in Australia in 1890 and become a naturalized citizen in 1904. Mr. Johansen was a wood merchant and lived in Flinders St., Adelaide. Shortly after his arrival, NK met an old friend from Dragør: Wilhelm Martin Schubert (WS). At first they both stayed with NK’s uncle, and they then moved into a house together. The following years NK worked in different places – for instance in a car factory – “as I had no education,” he stated once more. In 1915 they both signed up for the Australian Armed Forces, WS being stationed in Europe in late 1915 and NK in 1916. Neil Jansen Kroier, a Dane, was the informant in a charge of assault laid against Stanley Bailey on Thursday morning. It was stated that on Saturday, November 14, Mr. Bailey was in the Criterion Hotel with a man named Gordon McKenna. Kroier was passing with Mr. McKenna from the bar to the rear of the hotel, when he was assaulted by the accused, who was a member of what was known as the ‘Kin Hit Mob’. NK’s reaction to being called a German was probably due to the war of 1864 where Denmark lost a big part of its southern territory to Germany. During the First World War, Australia expected the young and fit men to sign up for duty in the Australian Armed Forces in order to help the British fight the war in Europe. Almost all young men between18–25 left for Europe to fight on the British side. More than 60,000 Australian soldiers lost their lives during the Great War, and many more returned as invalids. Today in every Australian town – small or big – one finds Memorials, not only from World War 1, but also from The Boer Wars in South Africa (1880 and 1892) World War 2 and the Vietnam War. So when Niels Krøjer and Martin Schubert signed up, they did as was expected of them. He was shipped off from Melbourne on December 16, 1916 and arrived in Plymouth on February 18, 1917. Shortly after, NK was sent to the Western Front e.g. France, Belgium, Ypres and Passchendaele. NK claims that he was lucky “never being hit’”, but according to the Australian Military Records he did suffer from tear gas and was blinded for three weeks. He even developed heart problems because of the explosions. 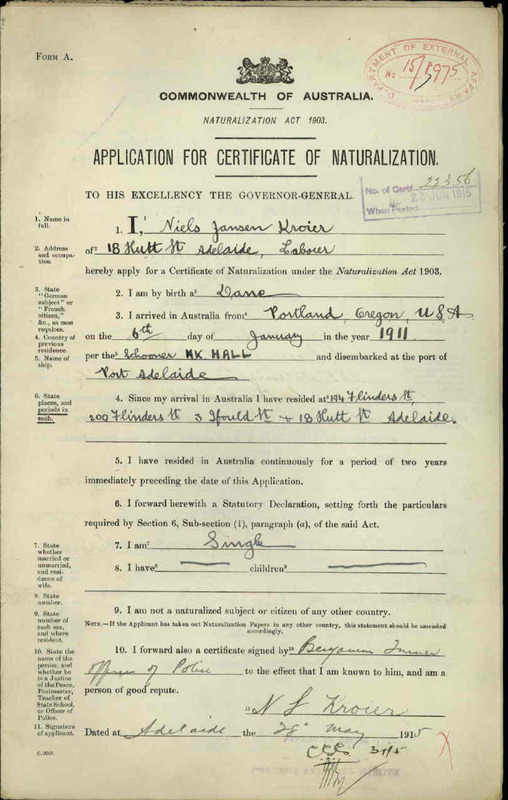 NK was reported sick several times, and on March 31, 1919 he was shipped back to Australia, registered as ‘invalid’. Mrs. Bertha Johnson states that she has received advice from the soldier, to whom she is recorded as next-of-kin, informing her that he has been admitted to convalescent hospital, suffering from the effects of Gas poisoning. She cannot understand why she received no communication regarding same from Base Records, and desires that any communication affecting above soldier to be sent to her at above address. This note, as well as the Official Sick Reports, therefore shows that Niels Krøjer was worse off than he later told to Capt. Bunzen. 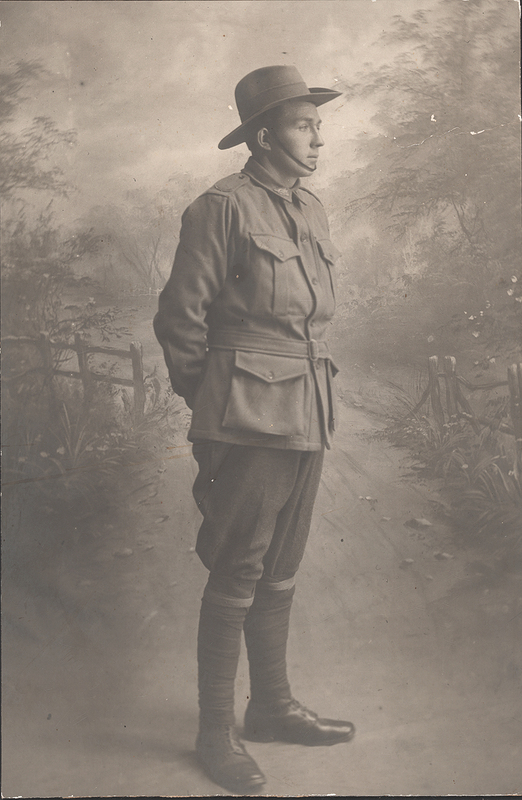 Further details about Niels Krøjer (Neil Jansen Kroier) are to be found in the Australian Website: ‘World War 1. Pictorial Honour Roll of Southern Australians’. Wilhelm Martin Schubert (WS) was born in Dragør May 19, 1885. 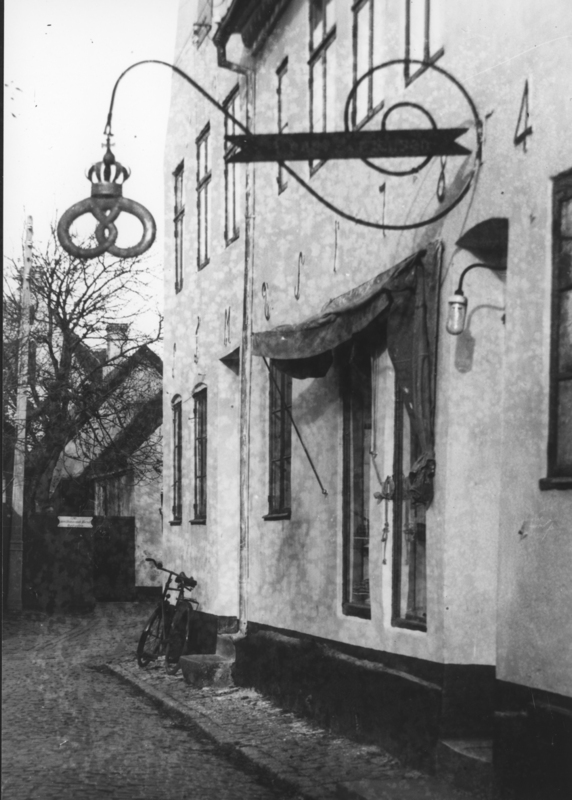 He was the youngest son of the baker Alfred Wilhelm Schubert, who owned the bakery ‘På Trappen’ (‘On the Stairs’) in Strandstræde, Dragør. In 1888 – when WS was 3 – his mother died, and in 1889, his father remarried. Two years later he was sent to live with the farmer and veterinary, F. J. Madsen, in Store Magleby, where Wilhelm worked as a farm boy. 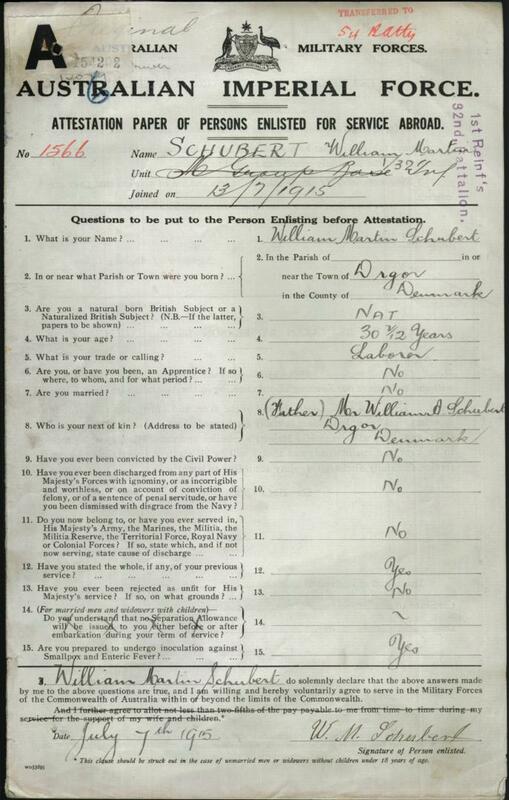 According to the 1906 Census, William Schubert was staying with a family member, registered as a sailor. 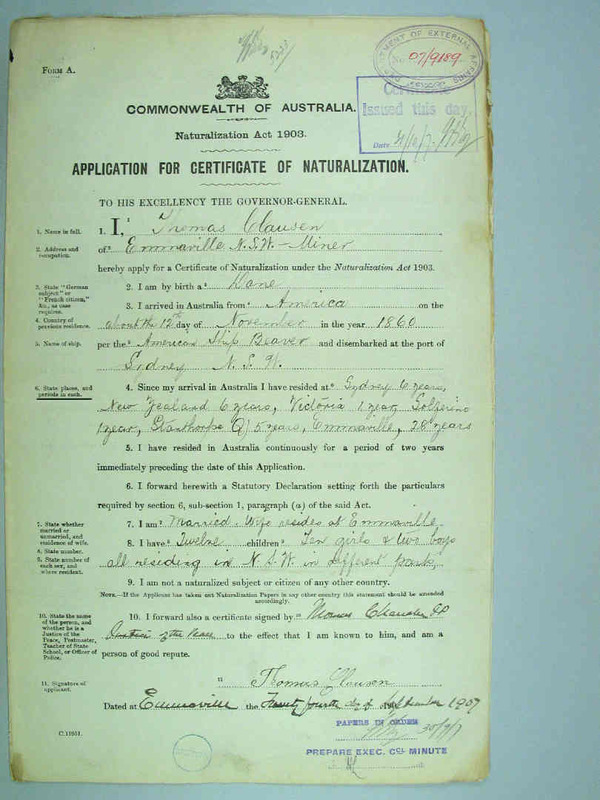 In the 1912 Census it is noted that WS had immigrated to Adelaide, Australia. The house where William grew up in Dragoer. In November 1915 Schubert was sent from Adelaide to Europe on ‘HMAT A2 Geelong’ – a converted passenger ship. He disembarked in Suez two weeks later, where he started serving under the British Army. Schubert was then transferred to France. He reported sick and was hospitalized several times (both in England and in France) due to: a bruised foot, a sore knee and finally, “French Fever” (an infection caused by lice) which hit many soldiers in the trenches during the Great War. On August 21, 1916, WS is finally back in service registered as “driver”. “Dear Sir, One of our staff, William Martin Schubert, enlisted two years ago. We know that he was transferred to the Artillery in Egypt and subsequently went to France. We had his later address, but lost it, and as we are sending all who enlisted from our staff Christmas Boxes, we shall be glad if you can tell us his latest address as early as possible. On August 18, 1919 William Schubert is ‘discharged in consequence of cessation of hostilities’. William Schubert died January 20, 1936 in Adelaide. The Skaarup travel party will be consisting of eight persons, that is master builder Skaarup himself, his wife Mrs. Evelyn, the daughters Vinnie (19) and Mitzi (15) and son Dennis (13). Miss Vinnie’s fiancé, custom house agent Leif Jørgensen and his two friends, mechanic Vagn Frandsen and Svend Petersen, who has been working for EAC, will also be joining the party. “We are leaving, because we would like to explore the world a bit,” master builder Skaarup says, while balancing on the top of the garage with tiles in his hands. “We have now lived in Dragør for ten years. We have to think of the children’s future. “There are more possibilities in Australia. “In the beginning only my eldest daughter and her fiancé wanted to emigrate. Then we started talking a bit more about it, and now we are all leaving. I have sold the car and this house in Solvænget (Sunshine Street). They have all been promised work in Australia after spending the first months in a camp outside Sydney, where they will be taught how to adapt to the new country. These days they are packing the last things. Mrs. Skaarup is holding the coffee pot up into the air. “We are only taking this and our clothes – and a lot of coffee bags,” she says. The Skaarup family went by train from Copenhagen to Cuxhaven in Germany. Here they had to wait for a week, before they could board the passenger ship ‘T/V Castel Felice’, which was undergoing renovation. The cabins had been changed to hold 8 persons, taking the family, who had purchased tickets for cabins holding only 4 persons, quite by surprise. 300 Danes were travelling on the ‘Castel Felice’ – 8 came from Dragør. Most of the time, due to the cramped conditions in the cabin, Vinnie, her fiancé and their friends slept up on deck. On November 12, 1956 they arrived in Melbourne, and were immediately sent north by train to the Immigration Centre, ‘Villawood,’ outside Sydney, where they lived in the barracks for 6 months receiving food, pocket money and English lessons. Then Vinnie and her father started working in a bottle factory, and soon after, Vinnie found work with two Dutch tailors in Sydney. The family thrived, and Harry Skaarup started working in his trade as a bricklayer. He bought several plots of land, building houses on them before selling them off. In the evenings and during the weekends he worked on his own house. Vinnie soon married and had two children (Kim and Majbritt) in1959 and 1960. She then moved back to Denmark with her husband and children. They all kept their Australian citizenship, and maintained close relations with family and friends in Australia. After Vinnie’s husband passed away, she returned to Australia and still lives there. However, she is now considering moving back to Denmark to be closer to her children and grandchildren, who all live in Denmark. Mitzi and Dennis both married in Australia where they have quite a few descendants. Harry and Evelyn also stayed in Australia, but after retirement they visited Denmark every summer until in their late eighties.